We make this every year for Halloween dinner. It would also be good for Thanksgiving morning breakfast and the whipped cream would be great on pumpkin pie. 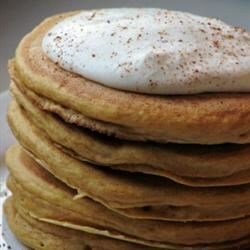 Whisk together the pancake mix, white sugar, cinnamon, the 1/3 teaspoon nutmeg, and ginger; set aside. Beat together the eggs, milk, pumpkin, and vegetable oil. Combine the two mixtures, stirring just until all ingredients are moistened. Heat a lightly oiled griddle or frying pan over medium-high heat. Pour or scoop the batter onto the griddle, using approximately 1/4 cup for each pancake. Bubbles will start to form in the pancakes. Cook until the edges of the pancakes start to look dry, and a bubble popped near the edge holds its shape. Flip the pancakes over, and continue cooking until the other side is golden brown. Repeat with remaining batter, adding more oil to the griddle if necessary. Stack the pancakes on a plate and keep warm until serving. For larger batches, keep pancakes warm in a single layer on a cooling rack positioned over a baking sheet in a 300 degrees F oven (150 degrees C). Place whipping cream in a small, deep, chilled bowl. Add the 2 tablespoons sugar, vanilla, and nutmeg; beat using a mixer with chilled beaters on medium-high speed until soft peaks form.